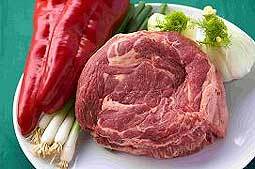 Beef is first divided into what are called primal cuts which are the basic cuts from which the different meats, you will find listed below, have come. 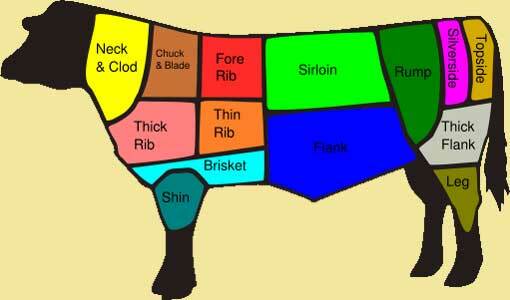 At the bottom of the page are two diagrams showing the American and British cuts of beef. If you look at these you will see that the closer to the middle back that the cut comes from the more tender the meat is. The reason for this is muscle use. The animal's legs and neck muscles do the most work and they are the toughest part of the animal . 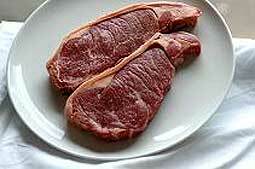 . . the further the cut of meat is from "hoof and horn" so its tenderness increases. Before the beef arrives in the butcher's for the customer to buy it has to be aged. 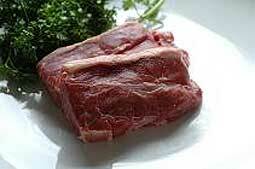 Ageing is very important both to the flavour and texture of the meat. 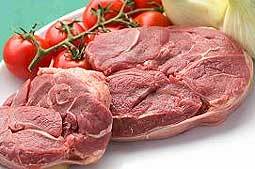 The ageing process allows natural enzymes to break down fibres and tenderise the meat. 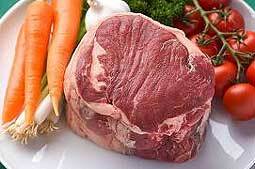 The process of ageing beef allows natural enzymes to break down fibres and tenderise the meat. 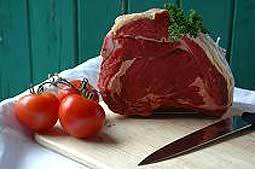 Originally beef was dry aged but the increasing cost of this saw the majority of beef being wet aged by the 1940s. Dry ageing gives a lot more flavour but the economics of modern food win out and it is rare to be able to enjoy dry aged beef in this day and age. 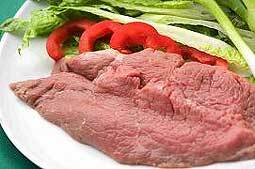 The method of cooking beef is largely determined by the cut of beef to be cooked. For example, tender (and generally more expensive) cuts of meat benefit from fast, high heat cooking while tough cuts benefit from a slower and longer cooking methods. 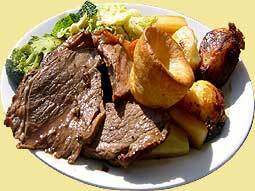 The premium beef roasting joint both tender and flavoursome. The premium beef roasting joint both tender and flavoursome. This one is for those who like it on the bone. 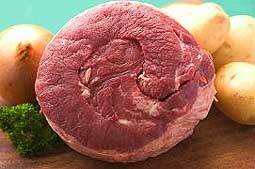 Beautifully marbled giving a delicious flavour, an easy to carve joint perfect for your roast dinner. The definitive roasting joint- the connoisseurs choice for taste and value. Make Yorkshire puds with the fat. 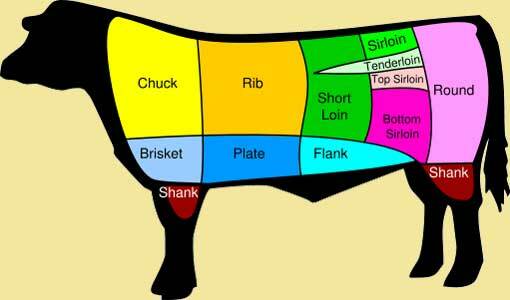 Topside of Beef, a traditional beef roasting joint. A very lean joint - good for corned beef or bresaola. 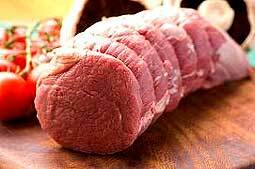 Luxurious cut of superb beef from under the sirloin. Grill or fry. 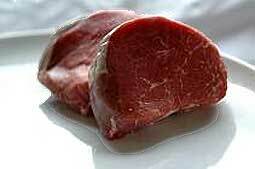 Used for Chateaubriand. 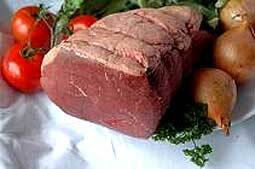 The delicious tender narrow end of the fillet used for grilling and frying. A cut traditionally used in a stroganoff. 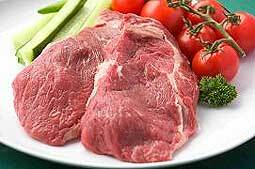 The Rib-Eye steak is a very popular steak in the States. Taken from the fore-rib this is a large steak with a beautiful flavour. 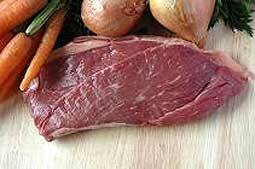 When beautifully marbled this steak has a delicious flavour and is superbly tender. Just don't overcook it! Really super for frying and grilling - the steak of choice for many meat eaters. 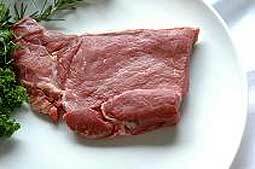 The Beef Feather Steak, is a forequarter steak, so-called because of the heavy marbling of the meat which gives the steak a feather like appearance. This cut was championed by Rick Stein in his Food Heroes series. 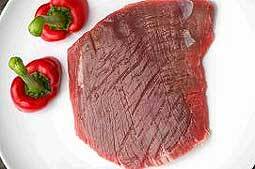 Serve very hot as this steak will toughen up on cooling, the flavour however, is tremendous. 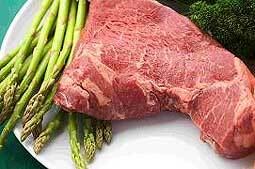 As the name suggests cook these steaks for no longer than 30 seconds each side. This cut makes the most delightful steak sandwich. Underrated. 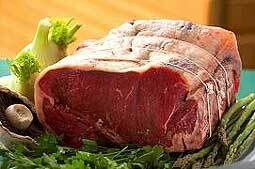 One of most delicious cuts of beef; beautiful when given time to cook. Chuck is another cut which benefits from time in the pan. Use it in stews and casseroles but remember don't rush. Real beef flavour in this fore quarter cut. Very slow roast / pot roast / boil. The traditional cut used in Cornish pasties. Four hours cooking will give this a satisfyingly rich gravy, while the meat still retains texture. Popular on the bone. 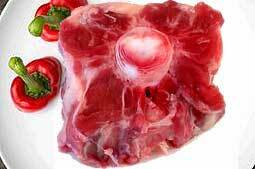 Once cooked for a long time, the oxtail creates a well flavoured liquor with gelatinous meat and sinew that just falls off the bone. 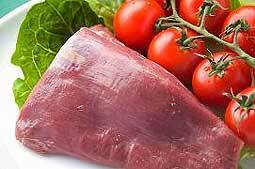 All the photographs and descriptions for this page have been provided by The Well Hung Meat Company from Devon.